Equipment: satellite TV; DVD; internet access Wi-Fi (included); electric heating. detached house, 4 people, 3 room/s, 2 bedroom/s, 1 bathroom/s, approx. 45 m², 1 floor/s, partially renovated 2016. Cooking corner: Kitchen/ cooking equipment: 4 electric plates, oven, combination fridge-freezer, coffee machine, freezer box. in the living room. Bathing jetty/bathing: bathing place (shared use) in approx. 1 km (gently sloping). Estate: (shared use with holiday guests): approx. 3000 m², open plot, in a hillside, natural surroundings, meadow. Information on the boat(s): Rowing boat with motor (15.0 hp; 13.0 foot; approx. 400 m distant; payment, on order). echo-sounder (payment, on order). Outdoor facilities: (private use): terrace, furnishing provided, transportable barbecue. Situation: suburbian area Balestrand, fjord view, view of Sognefjord. Wellness: shared use (free of charge): sauna. Arrival: Airport Bergen Flesland in approx. 196 km. Ferry port Bergen in approx. 209 km. Train station Flåm in approx. 120 km. Beach/waters: Fjord in approx. 200 m (Sognefjord). Bus stop: Bus stop in approx. 300 m (Skåsheimselva/Bratland). Nearest neighbour: Nearest neighbour in approx. 80 m.
Next village/town: Center Balestrand in approx. 2.8 km. Høyanger in approx. 45 km. Sogndal in approx. 48 km. Shopping: Next supermarket (Balestrand) in approx. 2.8 km. 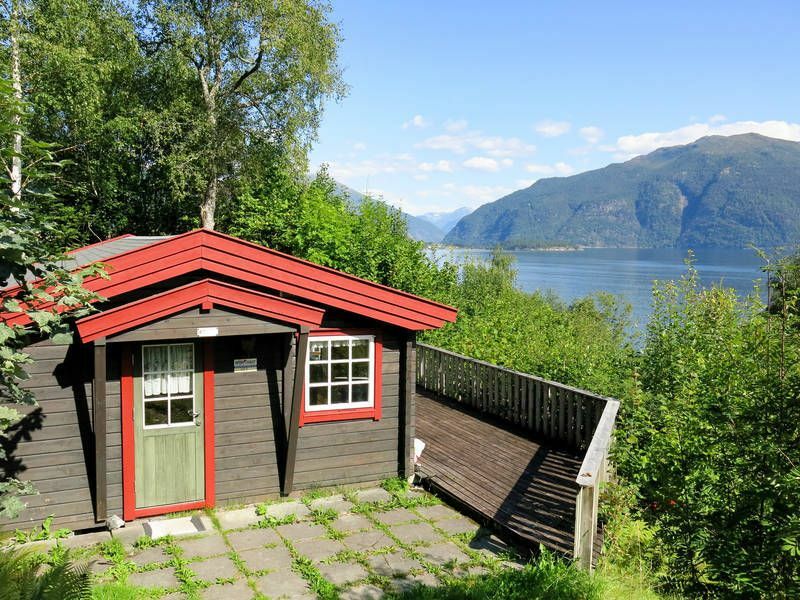 Schönes, schnuckeliges Holzhaus mit phantastischer Aussicht auf den Sognefjord, alles was man braucht, ist vorhanden. The overall impression of the chalet was that it could use updating. And everything looked and felt a bit shabby. The bed was fixed to the wall which made it difficult to get out of the bed for one person. The bedlinnen we ordered was a bit old. The view and the sauna where great though and we had nice weather the hole time. So it was a nice holliday, but I wouldn't recommend this chalet.